It doesnt matter, if you are just starting to plan how to manage a perfect etiquette for your weddings event even you have never experienced before, because this insider guide will show you all you have to know about wedding etiquette! THere is finally a new, breakthrough book created just for people like you! I myself have been a wedding planner for 15 years , but it was not easy my first two times! I mean, information on this is pretty hard to come across. Especially the kind of information I wanted to know more about. To be quite honest with you, I got tired of looking and searching all over the place, so I decided to create the definitive book on wedding etiquettes! This is not Like Any Other General or Generic Book On Wedding Etiquettes You Can Find In Any Store.. This book covers everything There is to know about wedding etiquettes . In fact, some people have called it the Wedding Etiquette Expert Guide ! * How to properly determine whos doing what. * Discover how to handle invitations and announcements. * The wedding etiquette breakdown of whos who. * Learn the several key elements to remember for the wedding shower. * A step by step guideline of what normal wedding showers include. * Discover the etiquette friendly ways of writing wedding invitations. * Learn all the different things you should include in the invitations. * Discover what else goes in the wedding invitations. * When and when not to accept gifts during your shower. It doesnt matter if its 2 AM on a Sunday, youll be downloading and reading Wedding Etiquette Secrets Revealed within just a few minutes. There is absolutely no risk to you - so what are you waiting for? Order now! And this is not one of those books in latin where you dont understand whats being said. Everything is in plain English, so you can put the translation book away :) This easy to read book on how to manage a perfect wedding etiquette are completely comprehendible and wont take weeks to read through. This truly is a one-of-a-kind book that can not be found offline or online other than right here. I urge you to place your secure order now. 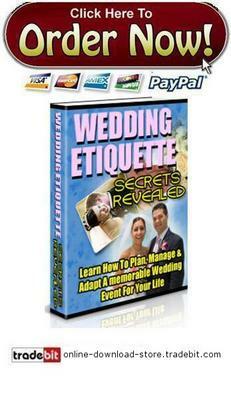 Wedding Etiquette Secrets Revealed normally sells for $74.00, but as part of my Finally getting this on the Internet sale, Im willing to give you an instant very heavy rebate.. So, you can get your own copy of my Wedding Etiquette Secrets Revealed for only $1.90!